On Monday, columnist James Freeman at the Wall Street Journal’s “Best of the Web” noted the selective memories seen in the vast majority of the press over President Donald Trump’s relatively noncommittal but nonetheless protocol-breaking tweet an hour before Friday morning’s upcoming jobs report. Many of them had a serious case of the vapors, but didn’t recall three instances when former President Barack Obama did the same thing during his presidency, with as much or more specificity. Some news reports gave Trump’s pre-release tweet more visibility than it deserved, while a few pundits and commentators went over the edge. At the Associated Press, as I noted on Sunday, economics writer Christopher Rugaber devoted Paragraphs 10-14 of his jobs report dispatch to the tweet, thereby treating it as more important than the record-low black unemployment rate of 5.9 percent he deferred until Paragraphs 19-20, and the record-low Asian unemployment rate of 2.1 percent, which he ignored. The worst Rugaber could say is that “officials are not supposed to comment.” If the Trump-despising AP could have given it a worse characterization, it would have. Nutting also wanted readers to believe that Dwight Eisenhower was the last president to tease the jobs report. That’s not true, as the WSJ’s Freeman noted — and we’re talking about far more than an hour, and instances which appeared to have far more potential for insider trading. 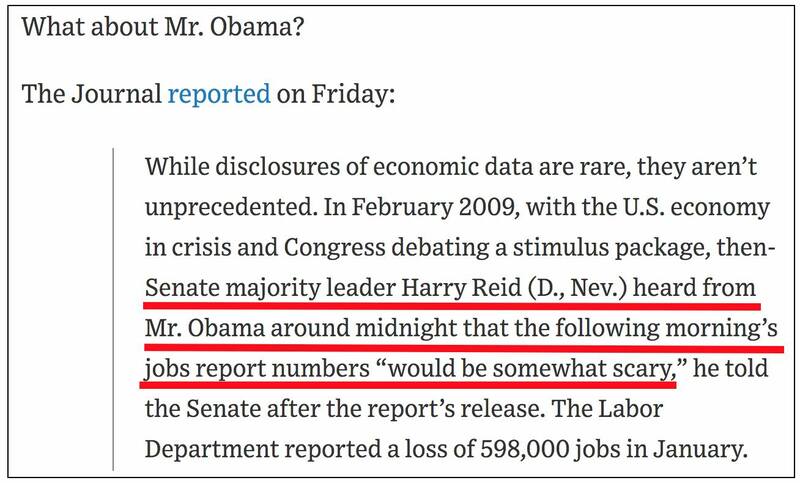 While Obama’s statement has a “likely” qualifier, it at the very least is the equivalent of Trump saying he was “looking forward” to the jobs report. Former Obama officials and most of the press either have really bad memories, or are engaging in public poses of selective amnesia. It’s not a good look.